THIS is a One Sweet Appetite original. I have seen copies around the web. But let me tell you… these little cuties originated right here. They are my pride and joy. 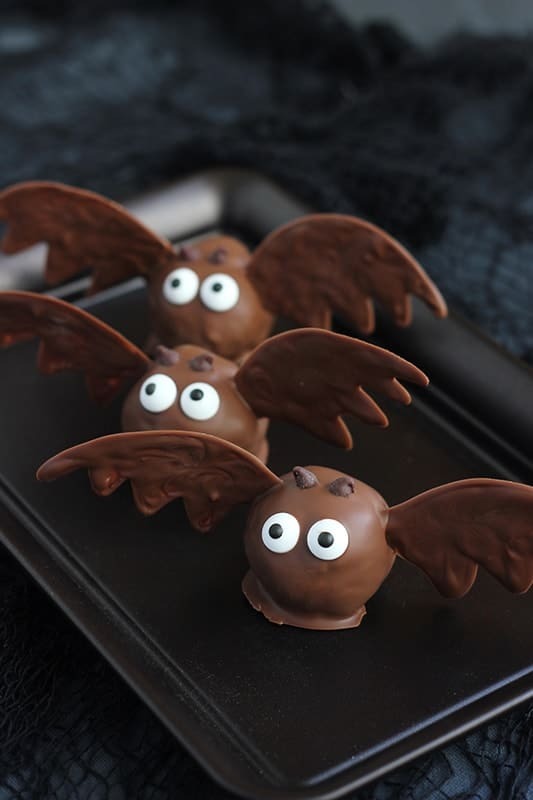 Super adorable and perfect for a spooky treat! If you are local you may have seen me make these on the local news! They have invited me back several times to share the easy tutorial. Why? All of the magic starts with my Oreo Truffles. 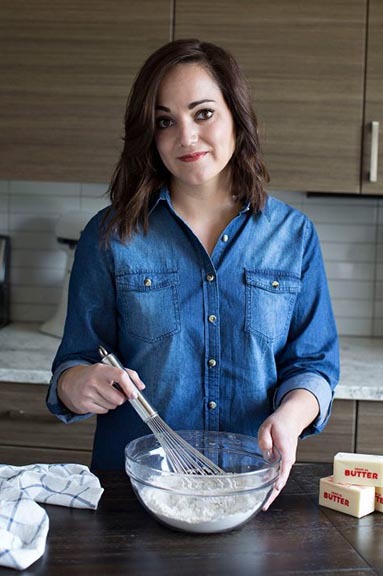 Whip up a batch and we can get started! Alternatively, you could use cake balls. I prefer the truffle because you only need two ingredients and a blender. You can have them ready in under 10 minutes. And they taste amazing. Once you have those beauties rolled and ready for the fridge it is time to gather materials. Draw out a few small wing shapes onto a piece of paper. Lay a piece of wax paper over the top of your stencil and tape it to the table top. 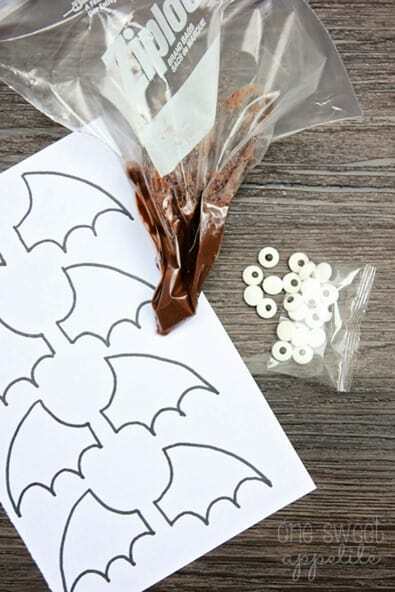 Add a small handful of candy melts to a sandwich bag. Microwave in 15 second intervals until fully melted. Snip a small corner off of the bag and pipe the chocolate following the stencil. Allow to set for a few minutes, or speed up the process by gently placing them into the fridge. 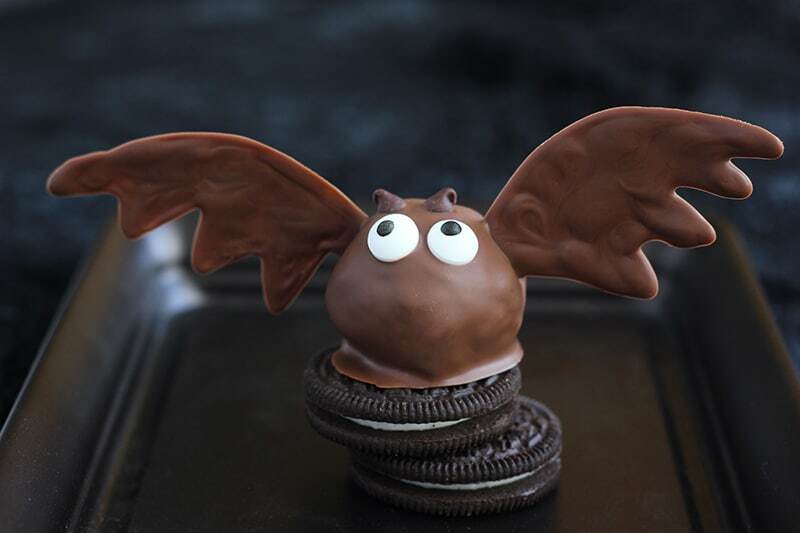 Once your wings have set and the truffles have cooled it is time to move to the next step. Melt the remaining candy melts in a deep but small bowl. Working quickly, dip one truffle into the chocolate. Make sure you cover it completely. Transfer to a sheet of wax paper. Place two wings, eyes, and mini chocolate chips in their correct spots. And that, my friends, is the gist of it. Repeat with your remaining truffles. Work quickly. Lay out all of your toppings and be ready to add them to the truffle fast. Reheat as needed. If you notice that your chocolate is starting to thicken you will need to heat it again. Place it in the microwave for 15 seconds and stir well. Like this recipe? You will love my Oreo Truffles, Frankenstein Oreo’s, Spider Web Oreo’s! Isn’t this little guy adorable? Or more like adorably delicious?? I have to say… I do love these fluttery little creatures. It was almost hard for me to eat them. Almost. These would be great to hand out to teachers, friends, family… Anyone that you might want to pass out a treat that is just extra special. Who can go wrong with Oreo’s? Place your Oreo cookies and cream cheese in a high power blender. Pulse until fully combined. YOur creativity kills me! This is absolutely ADORABLE!! I love, love, LOVE it!! 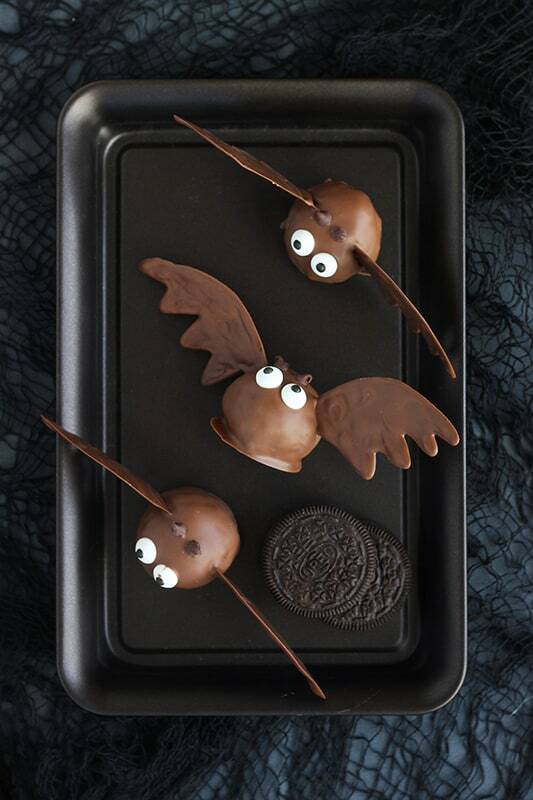 Those bats are so cute. I’m not a huge fan of Halloween.. I wonder if that will change when I have kids?? I love this! So cute and looks so good! Pinning now! So, so cute! You are so clever. I bet your son loved them!! These may be the cutest thing I’ve very seen! These are so cute! And I love oreo truffles, so win win! Where can I buy edible eyes? I found mine at Smiths but I’ve heard wal-mart, Michael’s, and Hobby Lobby have them as well. That would probably be less messy than the chocolate! Great tip. Oh my gosh these are the cutest things ever! Love! Oh my!! I am in love with these little guys. You are so amazing my friend. These are so stinkin adorable! I love the wings and the cute little eyes. Pinned! Love them. 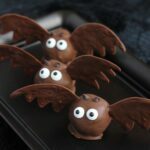 So making these this year! We’re crazy about Oreos, must try your truffles recipe. Adorable creatures! cutest thing!!! I love their little ears – ahhh! How did u get the wings to stay on? They just keep melting in my hand before they get a chance to set. My wings were a big fail as well, and time consuming! I don’t see how anyone gets them to stay on–as soon as I take them out of the refrigerator, they melt. I’ll look into that. Sorry! Just seen these on Pinterest and they are adorable! Can’t wait to try and make them, my son will think they are awesome! These are so stinkin’ cute! I’m making these right now! These are so adorable!! Pinned & would love to try to make these. You should follow me on Periscope (@1sweetappetite). I’ll be doing a video mid September with step by step instructions. Wow, nice creation, cutest bat ever.. These are adorable! Cant wait to try them out this holiday season!! 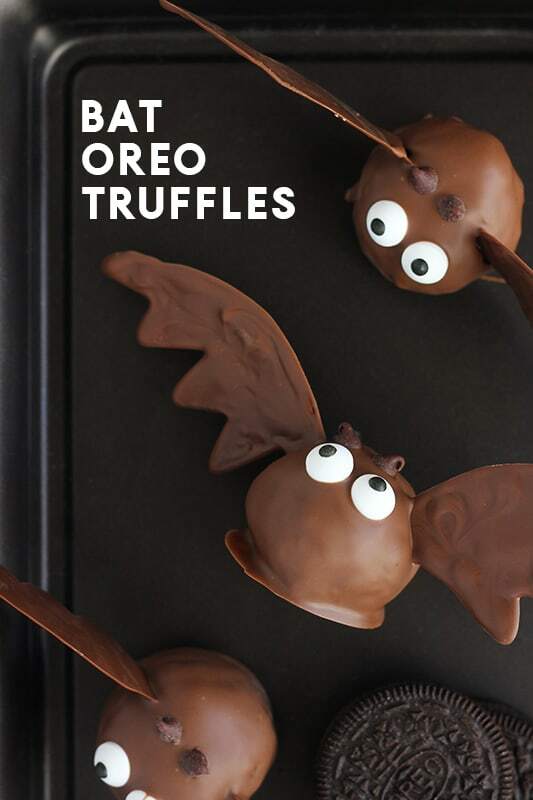 I am planning to make these for the office, but I was wondering if the little bats can sit out at room temperature? 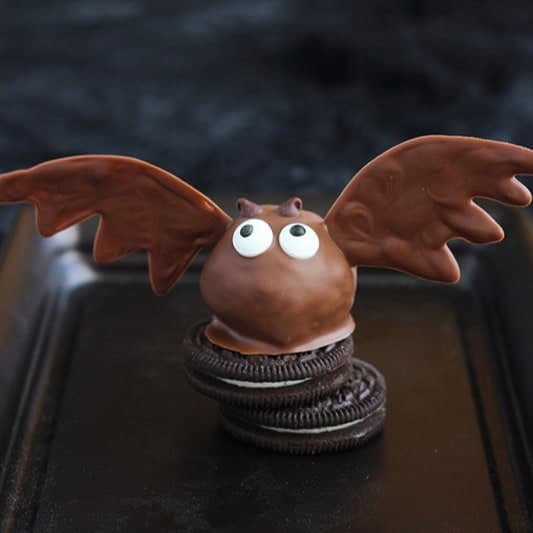 Not sure if the truffle/dough will get too soft, or maybe the chocolate coating and/or wings will melt/fall off? Do they need to stay stored in the fridge once they are all decorated and ready?